2017 was a busy year for Julia Jacquette. In February, she opened a retrospective exhibition of her work at the Wellin Museum of Art at Hamilton College entitled, Julia Jacquette: Unrequited and Acts of Play. An abridged version of that exhibition subsequently went on view at the Visual Arts Center of New Jersey, in Summit last Fall. The retrospective was accompanied by a gorgeous catalog, detailing her prodigious painting career, as well as by the publication of a graphic memoir, Playground of My Mind, a nostalgic visual meditation on growing up on New York City’s Upper West Side in the 1970s and its influence on her creative life. On top of a steady schedule of openings and speaking engagements related to the exhibitions and books, Julia teaches full-time at Fashion Institute of Technology and maintains two studios, one in New York City and the other in Amsterdam. It’s safe to say that Julia’s dance card is full, which is why I initially hesitated to ask if she would consider showing some of her work for Domestic Museology. But when her graphic memoir was published early last year, I was so excited by this project that I couldn’t help but ask. And I was delighted by her enthusiastic acceptance. 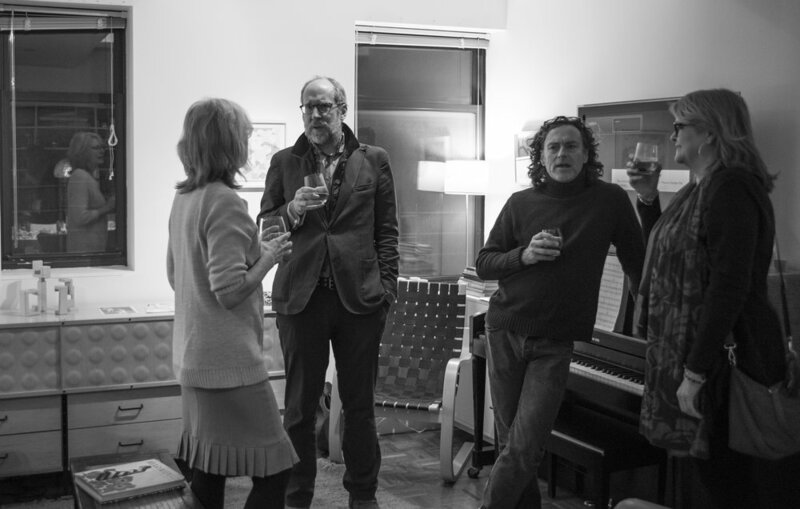 I met Julia and her husband, Dan Carlson, a few years ago, when they participated in a Domestic Museology opening for artist Andrew Zarou (whom I often refer to as The Great Connector - he really does seem to know everyone). It was a fortuitous meeting as Dan subsequently showed a series of photographs with us in the fall of 2016. One evening, after meeting Julia and learning she was a painter, I straight up Google stalked her, spending several hours looking at every image on her website, in awe of the formal beauty of each one, studying the sensuous detail. It was seduction — I was seduced. And that was the point. Take, for instance, her photoreal painting 36 Sofas, a colorful group portrait of three dozen different styles of this family-room fixture. Arrayed across a six-tiered riser, as if in a chorus or class photo, each sofa is identified with a different neurosis in a numbered descriptors across the bottom of the painting. Reading through the list, I had the sensation that Julia had somehow been inside my own head, cataloging my interior monologue in sofas. Never mind that I am also obsessed with buying a new sofa at the moment, and that my desire for home improvement is very much wrapped up in the kind of longing I feel when I scroll through home renovation blogs, wishing my apartment was bigger, more light-filled. And that somehow, everything would be better with just the perfect sofa. And glass of scotch. And shiny hair. While Julia’s large body of painting examines these collective neuroses up close, her graphic memoir, Playground of My Mind, (a play on Stevie Wonder’s, Music of My Mind, the soundtrack of her childhood), is a departure from those themes, a narrative review of the way her childhood - and particularly its built environment - shaped the way she works as an artist. 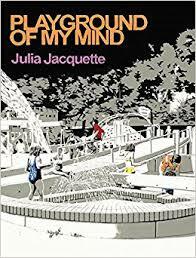 The book recounts Julia’s memories of growing up in NYC during a time known more for white flight and vacant lots than utopian design thinking. Yet, it was also the era of Mayor John Lindsay and Mitchell Lama Housing, city-sponsored apartment buildings for middle-income New Yorkers, where Julia spent her childhood living in Columbus Park Towers on Columbus Avenue and 94th street, just a block away from Central Park. Her mother was a librarian (yes, I do love that detail), and her father was an architect, so Julia and her brother, Lawrence, weren’t deprived of a cultural education. But the memoir focuses on the innovations in playspace architecture that were burgeoning, in spite of — or perhaps because of — the backdrop of municipal bankruptcy and urban decay. When we met at her studio to talk about what she would like to show at Domestic Museology, Julia suggested showing a series of four small gouache paintings that were abstract studies (or “riffs,” as she called them) on the designs included in her book. Along with the paintings, she would exhibit small objects that she used in the development of the memoir and would give a talk on how the project came into being. Julia’s connection with playgrounds is even deeper and more personal. In 1973, her father, William Jacquette, collaborated with two other architects to form, Ross Ryan Jacquette in a commission to design and build the Discovery Play Park on 100th street in Central Park. Julia had a front-row seat on contemporary playground design thinking — she literally played with the small models her father fashioned to work out the design. Like the playgrounds created by Friedberg and Dattner, Discovery Play Park was made out of simple elements: poured concrete, sand, water and wood, arranged in iterative and interconnected geometric shapes. These simple elements provided an open-ended structure, allowing kids to adapt and transform the space to suit their own imaginative play. That interaction between functional architecture and open playspace formed a distinctly urban visual vocabulary that left its mark on Julia and many of her friends and neighbors who also became artists. Reflecting on the underlying tension between risk (the abrasive concrete Brutalist forms, the rope swings) and safety (the soft sand to cushion a fall), Julia recognizes a formative problem-solving exercise that provided a template for how she addresses formal challenges as an artist. While her own artwork is visually different than the geometric playgrounds of her youth, looking back on the hours of open-ended, imaginative and iterative play, made possible by these environments, gave her a template for approaching her own creative process. The four gouache studies hanging in our apartment are emblematic of this idea. Each takes a design element that she used in the making of the book and extends the possibilities of the form. They are like small totems to the power of the iterative creative process. Playground of My Mind poses several fundamental questions, both literally and graphically: How does the design of your childhood environment affect you? Does it help to shape how you think? Does beautiful design teach us? Can it embody ideas that extend beyond aesthetics? The book made me think back to my own Midwestern childhood in late 1970’s and early 80’s, growing up in an outer ring suburb of Minneapolis. My youth was defined by exploring outside at a time when the surrounding farmland was being sold off and transformed into tract housing. My sister and I spent hours with neighborhood kids, riding bikes and playing in the excavated basements and unfinished construction that sprouted acres of soul-crushing subdivisions. Like Julia’s childhood, mine was a time of relative freedom compared with today, but it sorely lacked the thoughtful design of architects like Friedberg and Dattner. While most versions of idyllic childhoods involve interactions with “nature,” Playground of My Mind celebrates an urban utopia that doesn’t always get a lot of play. As we talked about a food theme for the opening that would connect to the work, Julia mentioned that the Silver Palate cookbooks were particular culinary touchstones from her childhood in the late 70s and early 80s. Both Julia and Joel remember their mothers’ devotion to the cookbooks, so we used the recipes as inspiration to create a “food playground” using the same geometric forms that were the building blocks of the Adventure Playgrounds of 1970’s New York. Living with Julia’s paintings and paging through her book have heightened my sensitivity to my own family’s experience in the urban built environment. How might it be impacting our children? Joel and I deliberately chose to raise them in Manhattan, foregoing the outdoor space and suburban sprawl of our childhoods (Joel grew up in suburban Detroit). We, too, spent countless hours with our kids at the Adventure Playground on 67th street, not knowing it’s storied architectural history. Do kids today play the same games and use the same structures in the same ways they did 30, 40 years ago? Maybe with the hindsight of years, they’ll look back on the forms and shapes they played and lived among in their youth and understand anew how they shaped and informed the world they see today.